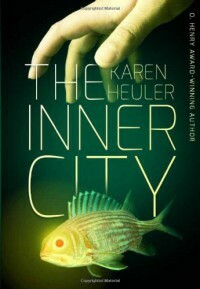 I received a copy of The Inner City from the author in exchange for an honest review.I really truly enjoyed the series of short stories in The Inner City. I enjoyed the strange and rather creepy elements that were incorporated into each of the stories, even some of the more docile ones like "Fish Wish" that weren't as scary as some of the others left a lasting impression on me. My favorites among the stories were probably as follows, "Down On the Farm", "The Escape Artist", "Creating Cow", "How Lightly He Stepped in the Air", and "Thick Water". The sense of wonder I was left with is something I sometimes have trouble finding when reading although its a part of it that I really enjoy. Being left with questions after you read is something that helps it seem like the characters are real and breathing out there somewhere instead of taking up space on paper. Karen Heuler has made her characters come to life and I highly recommend The Inner City to those who don't cringe at strange and peculiar happenings.